So far we did some really popular reviews about TOMOLOO hoverboards like K1 X-MEN, K3 Galaxy Chariot and Q2 Fire Kylin. Tomoloo is a hoverboard company with, maybe, the deepest production line of hoverboards, from the V1 POLEAXE, V2 Eagle, Q1 Sea Lion, Q3 Star Traveler, K2 Armor Hero and already above mentioned models. This huge variety of hoverbords are not just interesting in design but, also, quality products. Do not forget that each of these models one can be fully customized to a rider needs and desires. Also, every single model has its design and name inspired by some mythical or real objects, stories and movies. Thus, V1 Poleaxe is inspired by Nordic Poleaxe referring to power and authority this model will give to its rider. Tomoloo V1 Poleaxe is a part of V line of new generation hoverboards, UL2272 certified, made of high quality fire retardant materials shaped in superb and imaginative design giving the avant-garde and fashionable look unique to Tomoloo hoverboards. In addition to the UL2272, TOMOLOO hoverboards, including V1 Poleaxe, are certified by CE, FCC and RoHS, batteries are certified by UN38.3 and MSDS, and the chargers certified by GS, SOSA, CB, CE, RoHS, UL and IEC series standards. This puts TOMOLOO hoverboards very high on safety lather giving the rider extra safety and self-confidence. Besides V1 Poleaxe this line includes V2 Eagle hoverboard. 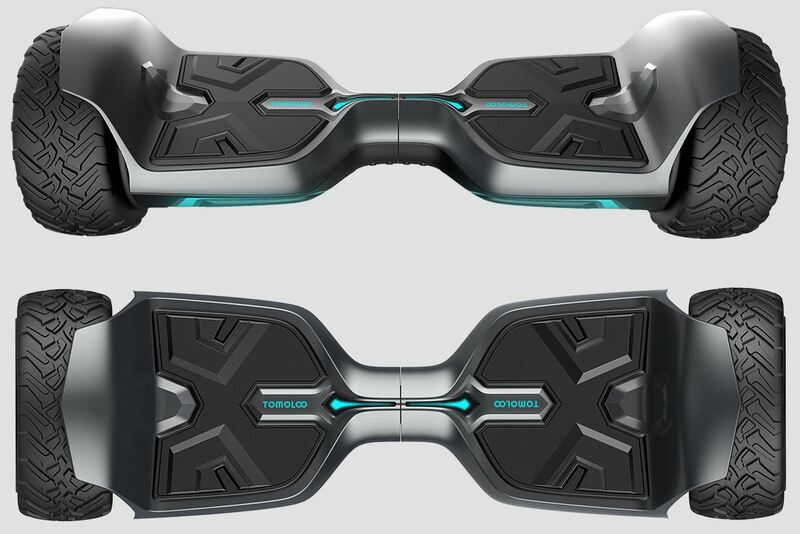 Both V series models are off-road hoverboards with 8”. As other Tomoloo hoverboards V1 Poleaxe has LED headlights with RGB LED design allowing the rider to adjust the color of LED lights through personal Tomoloo App to suit his personality and enabling better visibility during the night. Through the App you can control on/off switch, standby mode, steering sensitivity, maximum speed limit, battery status, riding mode, mileage, music and finally already mentioned color, brightness and effect of integrated LED lights. Also, it has a waterproof cap for power jack keeping it safe from water during the ride. It is very useful and practical because it ensures that your power station is always dry and safe. As a power source it uses Li-ion batteries which are placed inside fire retardant shell thus giving extra security for the rider. Smart Battery Management System is in its brightest edition with over current, overheating, short circuit, overcharge and excessive discharge protection. Built-in Bluetooth speakers are using Bluetooth 4.0 technology providing Stereo surround sound. Maximum speed of Tomoloo V1 is 10 mph with maximum driving range of 12 miles or up to 2 hours of pure joy before recharging. It is available in different colors but we liked the best metallic grey. All this makes Tomoloo hoverboards the best selling hoverboards this year.